Most of us are pretty excited to board a plane, especially when you’re flying to a vacation destination. Even when traveling for work, flying to another location often brings a welcome change of scenery. For some of us, however, flying brings some nervousness and anxiety – it’s hard not to worry about a plane crash or some other serious incident. That said, we tend to forget about the run-of-the-mill accidents that can happen while flying. Even though these aren’t as scary as a plane crash, these accidents can lead to serious injuries. If you do get injured while flying, the airline may be responsible for your medical bills and other losses, so it’s important to speak to an attorney after you’re injured on an airplane. Lack of personnel training and established safety protocols. 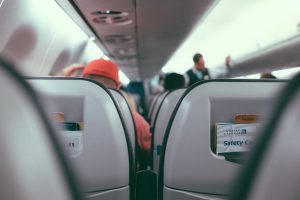 This is why you have to listen to the safety presentation everytime you fly on a plane – if they fail to provide it, they could be held liable for any injuries you suffer due to their failure to warn you. Falling baggage. While checked luggage is placed underneath the plane, the overhead bins are full of heavy carry-on items. Thanks to expensive fees for checked luggage, some of these items are small suitcases filled to capacity. Other common items include laptops, bookbags, and backpacks. By failing to ensure the bin is closed and fully secured, these items can fall out and cause serious injury by falling on someone’s head or neck. The attendants should also warn passengers to be careful when opening the bins. Turbulence. While the airlines cannot control turbulence, they do have an obligation to warn passengers when turbulence is anticipated and take measures to secure the cabin. Slip, trip, and fall accidents. Falling while on an airplane can lead to serious injury given the confined space. Attendants should take steps to ensure the aisle is free and clear of any debris or items protruding from underneath the seats that may present a tripping hazard. They should also promptly clean up any spills that could cause someone to slip and fall. Food and beverage carts. Food and beverage carts are extremely heavy and can cause severe injury if the attendants fail to lock the brakes when they aren’t moving them. If you’ve been injured on an airplane, you should contact an experienced airline accident attorney to evaluate your case. If the airline was negligent, they may be held liable for your injuries. The lawyers at Slappey & Sadd are here to help – if you’d like a free consultation, call us at 404-255-6677 or email us today.